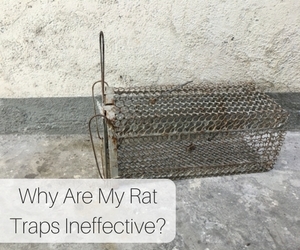 Why Are My Rat Traps Ineffective? Rats pose significant health risks to humans and pets due to the diseases they carry, such as Rat-Bite Fever, Salmonellosis, and Leptospirosis. Additionally, these critters have a tendency to cause expensive damage homes all over the Dallas area. If you notice signs of rat activity in or around your home such as small pellet-like droppings, chewed up wood trim or food containers, or strange noises coming from your walls and ceiling, it’s time to take action. For many, that means purchasing one or more of the many trapping options available. However, store-bought traps are only marginally effective, and most infestations require more comprehensive solutions. Here are just a few of the reasons why most DIY rat traps fail. Rats are more cunning and intelligent than most people give them credit for. Some have even been seen stealing the bait off of traps without setting them off. Others sometimes figure out how to trip the trap, and will steal the bait once the trap is no longer active. This means that without the proper type of bait and trap, you may be in for some frustration before catching even one rat. The effectiveness of any rat trap, professional or DIY, is based primarily on its location. Traps need to be set in areas that are frequently travelled by rats for maximum effect, and the best way to determine the paths they take is with a thorough home inspection from a professional rat removal specialist like those here at Critter Control®. Even if your traps are set in high traffic areas, rats are adaptive and will find alternate routes, making for a frustrating process. Once inside a home, rats breed alarmingly fast. Even if you’re successful in trapping a handful of rats on your property, chances are there are plenty more where they came from. Simply trapping rats does not address the root cause of your infestation, which means that it can go on indefinitely unless additional action is taken. For these reasons, we recommend calling for professional guidance at the first sign of a rat problem. The rat trapping and removal specialists at Critter Control® of Dallas can get the nuisance critters out safely and efficiently. Contact us today at 817-222-1101 with any questions, or to schedule a complimentary home consultation.